Staree is owned by IZEA, who is known best by their ground breaking development of paid blog posts, tweets, and check-ins. IZEA launched this new development called Staree in May 2012. 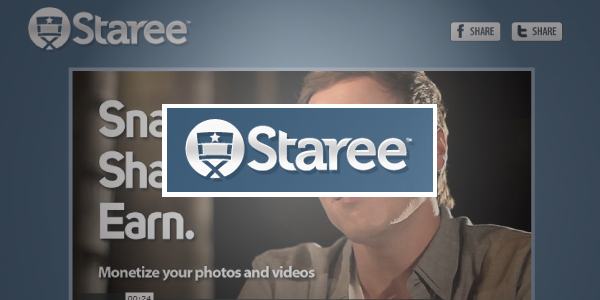 Staree is all about pictures, and making money off of those pictures through Social Networking. You upload your pictures and share them through Facebook and Twitter. Advertisers pay Staree to place their ads with relevant pictures, and every time someone views you picture, you get paid. Apparently tons of celebrities signed up during the Beta phase, and now it is open to everyone. Hmmm, well, that is up in the air at the moment. The Staree blog says up to $2500 per year easily. Here is the catch, it all depends on how big of a Facebook or Twitter following you have. Therefore, celebrities stand to make much more than this. Staree bases this amount on a random account with what they say is a non-celebrity level fair following. What cannot be ignored, however, is the comment left by a user stating he was posting regularly, had a decent following, and had only made five cents in the couple of weeks since he joined. Another commenter noted that he had over 300 pictures posted, with captions, and had no way of seeing how many views the pictures were getting. Yes, IZEA is a legitimate company that is known to pay on time. This blog has used IZEA with paid posts and even for advertising and has so far been paid in full. For every click your picture gets, not only do you make money, but a portion is donated to a charity picked by IZEA. The first recipient of these funds is Give Kids the World. They say they are the recipient for June, so they must be planning to pick a new charity monthly. You cannot just sign up and start uploading photos. You have to apply, and the first step in the application process is to link your Facebook or Twitter account. You can submit your Klout score as well, which the website says they may use to determine eligibility. Commenters on the blog are noting that it is taking a while for applications to go through, and Staree has admitted as much after seeing those comments on their own blog. They say there is a long waiting list. This same post also advised current users that there were fast pass codes on the site that they could share with their friends to help them out. I guess that means if you want to expedite the process find someone you know that is already in and get them to give you a code. This is a legitimate way to make money from home, but it will not yield a high income right away for most. More than likely it will be a fun hobby that brings in some spare change now and then, unless you have a huge Facebook or Twitter following. Then again, it is not really any different than the content sites that pay per view, so that if you promote your photos enough you could build a sizeable income in time. My personal take on it is that there is no reason not to apply, and if you are accepted, enjoy seeing some change roll in now and again while also knowing that you are helping out those less fortunate at the same time. This was definitely an interesting read. It’s amazing all the small money making opportunities there are on the Internet. With Facebook’s recent changes (paying to promote posts), I wonder if it would really do any good. Only time can tell I suppose! Can you promote photos on a blog? Or just with facebook? Awesome! I hope you can come back and let us know how it turns out! Have you earned anything with this? I haven’t made a cent from this service. I have a 20,000+K following on social media, post original beautiful content that is one of a kind, and promote to Staree (and I know someone has clicked the links).. All of which has equaled a big waste of time. I can usually make money from work at home sites. Not this one. I am a fan of Izea, but not Staree. I haven’t heard first-hand from one person using this service. Also, my last complaint is that your photo wall will fill up with other people’s pictures. For example, there is a picture of some random lady on my wall. I didn’t put it there. I can’t delete it. And now my profiles gives the assumption that I am her. Many updates need to be done to Staree. It is a great concept but needs some work from a development and marketing team. Another small downfall is that you can’t login on Mobile site, you have to switch to Desktop View. It’s a hassle. The Android app is also pointless, it just takes you to the site! Hope this helps some people. I will continue to try to make $$ off of Staree and will come to change my opinion if needed.